Yameen Rasheed was murdered on April 23, 2017. Here is a timeline of key events before and after his death. He tweets about death threats and asks police to investigate. Dear @PoliceMv. Last September, I filed a report on death threats I received. Any plans of ever calling back, or investigating those? 02:23 Yameen heads home from work, the Maldives Stock Exchange. 02:34 Two men enter Spetiula, where Yameen lived. A third person waits outside. 02:46 He enters the building, presses the elevator button. There is recorded footage of two men stabbing him. The pair leave, along with the third person. 02:58 A report of a man found unconscious in a pool of blood inside Spetiula is made to Police Command Centre. 03:05 Police start processing the crime scene. 03:10 Yameen’s body is taken to the Indhira Gandhi Memorial Hospital. Friends, family members and journalists release rose-red helium balloons in honour of his memory. Yameen’s parents call on the government to include international investigators in the police inquiry. Police release photos of two suspects captured from a CCTV camera inside the stairway to Yameen’s building and from a camera outside the building. A Facebook page called Qafila (meaning ‘caravan’ in Arabic) threatens more killings against those it accuses of campaigning for secularism, speaking of a hit list and announcing there will be no rest until all apostates are beheaded. Hundreds sign a petition calling for a credible investigation into Yameen’s murder and the abduction of journalist Ahmed Rilwan. Yameen’s father seeks help from diplomats and international organisations in Sri Lanka to pressure the government to carry out an independent investigation with foreign assistance. VFP reports police have told Yameen’s family that the suspects caught on security camera cannot be identified because they were in disguise. Police refuse to accept the family’s petition calling for a credible investigation. 04:20 Police arrest first suspect, Mohamed Dhifran. President Abdulla Yameen speaks about hate speech and the limits of freedom of expression. His remarks are viewed as a reference to Yameen Rasheed, whom ruling party members accused of apostasy and insulting Islam. 16:49 Police arrest second suspect, Hassan Shifaz. Police release a statement about the arrest of two potential suspects shortly after Yameen’s family say they are suing the police for negligence in protecting their son and failure to investigate death threats. 12:47 Police arrest third and fourth suspects, Ahmed Nasooh Abdulla and Mohamed Yashfau Rasheed. 02:50 Police arrest fifth suspect, Ismail Haisham Rasheed. 16:40 Ahmed Zihan Ismail, a sixth suspect, is arrested. 22:38 A seventh suspect, Ismail Rasheed, is arrested. Police reveal four more suspects have been arrested including the two identified from earlier CCTV footage. Three UN human rights experts call on authorities to carry out a thorough and independent public inquiry. Yameen’s family petitions the UN to press the government to allow an independent investigation, led by the office of the UN human rights chief or a reputable international organisation. Police block a march by friends and family to mark one month since Yameen’s murder. There is a sit-in protest to avoid a confrontation with police. 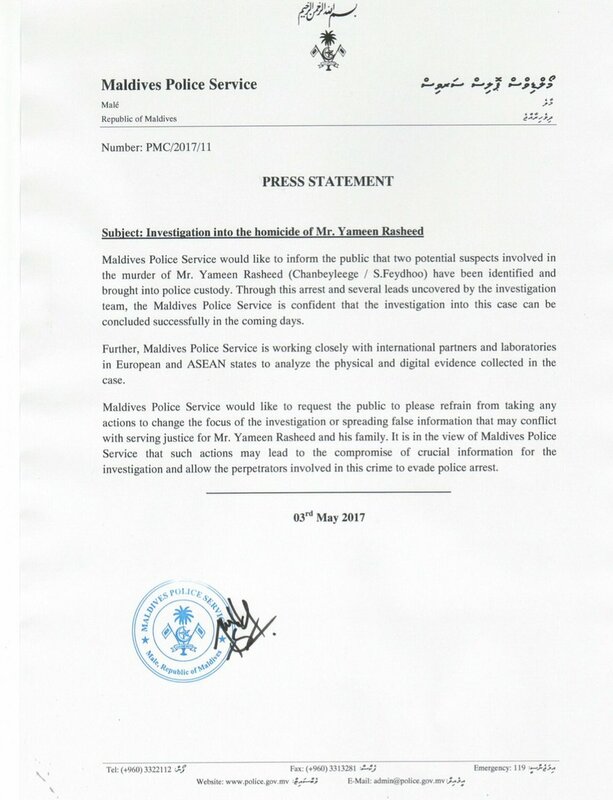 Yameen’s family appeals to the police to disclose information about the investigation, claiming they have been unresponsive to repeated attempts to contact them. 08:05 Eighth suspect, Hussain Ziyad, is arrested. Police reveal the identities of three suspects. They say of the seven suspects in custody, Ismail Rasheed, 25, Ismail Haisham Rasheed, 21, and Ahmed Zihan Ismail, 22, have been identified as the prime suspects. Suspect Ismail Rasheed’s family alleges attempts by the police to coerce him into giving false testimony. Yameen’s father accuses police of destroying forensic evidence gathered from the crime scene. Police wrap up their three-month long investigation and forward cases for prosecution. Friends and family mark 100 days since the murder with a tweetstorm and a silent vigil outside his home in Malé. Senior policeman tells the press that Yameen was killed by men who believed he was “mocking” Islam. Trial of six out of eight suspects begins with closed preliminary hearing. Ismail Haisham Rasheed, Ahmed Zihan Ismail, Ismail Rasheed, Mohamed Dhifran, Hassan Shifaz, and Hussain Ziyad are charged with felony murder and remain in state custody. The offence carries the death penalty. A seventh suspect, Mohamed Yashfau Yameen, is charged with aiding and abetting murder and transferred to house arrest. The Prosecutor General’s office declines to press charges against an eighth suspect, Ahmed Nasooh Abdulla. Civil court dismisses the family negligence suit against the police. Second preliminary hearing held behind closed doors. Third preliminary hearing held behind closed doors. Administrative meeting between court staff and defendants. Haisham, Zihan, Dhifram, and Shifaz deny allegations regarding Yameen’s murder at fourth preliminary hearing, which is held behind closed doors. Fifth preliminary hearing held behind closed doors. Yameen’s family takes negligence suit to High Court. Administrative meeting with court staff, defendants, and prosecutors. Sixth preliminary hearing held behind closed doors.